Englewood Votes! Hosts Mayoral Forum on Wednesday 2/18: Candidates Confirmed | R.A.G.E. On Wednesday, February 18th voters will hear from the mayoral candidates for the February 24th municipal election at the Englewood Political Symposium at Lindblom Math & Science Academy, 6130 S. Wolcott Ave, from 6pm – 8pm. Candidates Jesus “Chuy” Garcia, Willie Wilson, William “Dock” Walls and Robert “Bob” Fioretti have all confirmed their attendance. 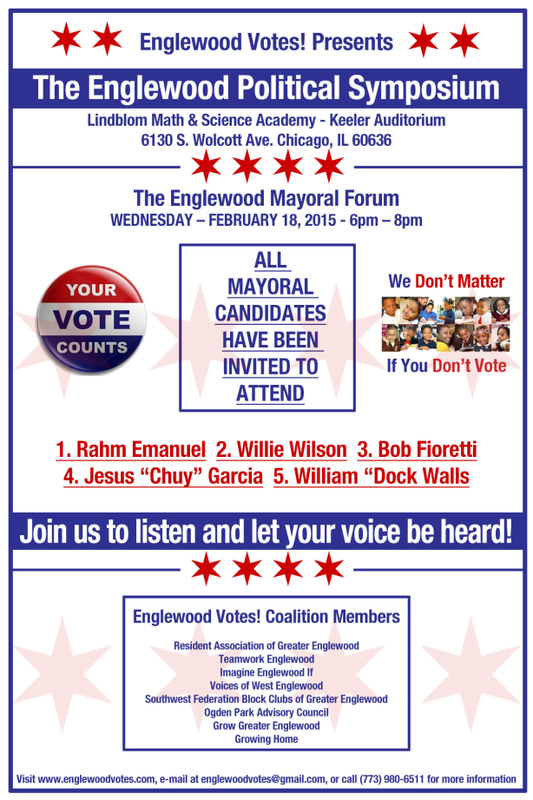 The Englewood Votes! staff is working diligently to get Mayor Rahm Emanuel to confirm his appearance at Wednesday’s forum. The forum will be moderated by journalist Robin Robinson. So Fresh Saturdays’ is Baaaack for Black History Month!